(Editor's note: We normally don't run plugs for college marching bands, but it's football season, and a plug for marching music in this high-profile time of year is a plug for DCI.) The Illini drum line wants your help Yes, this is a plug for a college drum line, but for all the help that it has given so many members of drum corps over the years, it is only fair. 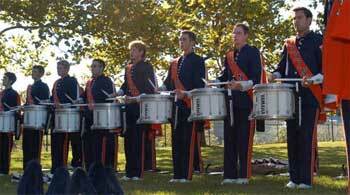 The 2003 Illini Drumline snare section. The Illinois Drumline Foundation, a non-profit organization, run by University of Illinois Drumline alumni, supports the past, present, and future members of the Illini Drumline through scholarship opportunities, raising of funds for current needs of the line, and even through simple support and instruction. The foundation operates a Web site, of which the key part is the merchandise section. Really, I want you to buy some stuff. If you like reading "Project," maybe you should buy something! If you are a drum corps alum, and you see an old friend you marched with in this picture, maybe you should buy a shirt, or a party chicken visor, or something. The following is a brief history of the University of Illinois Drumline, by Dale Hallerberg, Cavalier alum (1977-1980) and Illini Drumline alum (1978-1982). "Of course there were marching drums all the way back to 1906 or earlier, but the drum line made a big transition to corps style under the leadership of section leader Russ Weber starting in 1976. Russ brought new ideas, new street beats, and encouraged an influx of drum corps talent that in previous years would not have marched in the band at all. He also convinced the director to start playing drum corps rips like "Channel One Suite" and many others. "With a set of better drums (bought used from the Schaumburg Guardsmen) and new uniforms in 1979, the transition to a corps-style drum line was complete, but we were able to maintain that delicate balance of drum line innovation while still keeping many traditions from prior generations. "By the way, we played "matched grip" from 1978 to about 1983. We were trying to imitate Santa Clara and solve some serious left-hand problems. "Russ also had smart guys around him with ideas like selling drum line merchandise to high schoolers, drum line logos, registering the drum line as a official student organization, renaming the percussion section as the "Drumline" (1977), and acting as a catalyst for what we believe was the very first indoor drum line competition, held in 1980. "We've had quite a few Cavalier/Illini guys, at least 15 I can think of offhand, and several other corps represented through the years. At least six guys in the drum line marched with DCI championship-winning corps. "Since then, the Illini Drumline has improved incrementally every year. I suppose there have been some slightly down years, but that's not a surprise in a college activity. What I've seen is a spiral of talent and effective teaching steadily improving the line. First-hand drum corps experience has been irreplaceable, but lots of drummers who were never in a corps have benefited from teachers who have drum corps experience. At most high schools, all a potential drum instructor has to do to get a job is show up in their corps jacket. "What is great to see throughout the years is the close camaraderie that has been the hallmark of the drum line. In many ways the drum line becomes a sort of social fraternity and sorority, with drummers spending practice time and lots of social time together. This extends into the band too, you will see lots of dating in the band, and lots of eventual marriages -- drummers with Illinettes, flags, piccolos (my wife for example), and even with other drummers." Currently, the drum line has members and staff from the Cavaliers, Glassmen, Capital Sound, Pioneer and Carolina Crown. There have been members from the Geneseo Knights, and even Suncoast Sound. I'm sure many more that I fail to mention. I would love to if I hear from you though! The Illini Drumline currently marches eight snares, four tenors, five bass drums and nine cymbals, and you can see them at any home football game performing with the University of Illinois Marching Illini. Keep reading "Project." Thanks! And go buy some stuff!